Pears are a sweet, tasty fruit that's full of fiber, low in calories, and loaded with antioxidants, including vitamin C. They are native to Europe and West Asia, and have been used in anti-inflammatory, diuretic, and anti-hyperglycemic folk remedies in China for more than 2000 years. 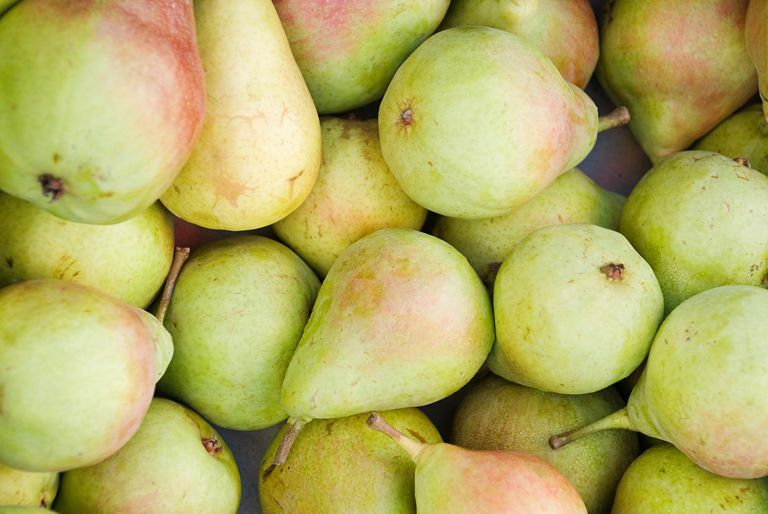 Most pears grown in the United States are grown in Washington and Oregon. There are many varieties, including Anjou, Bartlett, Bosc, Comice, Concorde, Forelle, French Butter, and Seckel pears. Pears are a great source of insoluble fiber, containing almost 6 grams (22 percent of the recommended daily amount) in one medium-size serving, which makes them very filling. Fiber is the indigestible part of carbohydrate that helps promote bowel regularity and can reduce bad cholesterol. Pears are high in fructose and other sugars. However, with a low glycemic index of 38, they are still an appropriate choice for people on low-carb diets if eaten in moderation. Pears are great for people on low-fat diets, as they contain negligible amounts of both saturated and unsaturated fats. Pears contain very little protein and are not a complete source of all essential amino acids, but they do contain trace amounts of the amino acids leucine, lysine, and glutamic acid. One pair contains about 6 percent of the daily recommended amount of copper and 5 percent of the daily recommended amount of potassium. Copper is important for the formation of connective tissue in the body as well as healthy brain and nervous system function. Potassium supports muscle function and nervous system communication. Pears are a good source of vitamin C, containing approximately 7 mg in one medium-size piece, which is 10 percent of the daily value. Vitamin C is important for cell growth and repair as well as preventing oxidative damage. Vitamin C has been shown to boost immunity, aid in the healing of cuts and bruises, and even protect against infectious diseases. One study has indicated that the particular combination of phytonutrients in apples and pears may help improve insulin sensitivity and reduce the risk for type 2 diabetes. Flavonoids, phenolics, and triterpenes in the skin of the pears were found to confer antioxidant and anti-inflammatory properties. Nutritionwise, does it matter if I eat the skin of a pear or not? The skin of a pear is where a large portion of its fiber resides, as well as high concentration of nutrients, so it's best to eat this fruit with the skin on. When doing so, make sure you wash them thoroughly as pears do fall on the Environmental Working Group's Dirty Dozen list, making them one of the fruits that contains the largest amount of pesticide residue. If possible, purchase organic. Freezing fresh pears is not recommended because juice and fibers will separate in the thawing process, and the results are not at all desired. However, freezing a cooked or processed pear (such as pear sauce) to which sugar has been added will work. Place the pears in a tightly sealed container prior to freezing to help reduce freezer burn. Pears are a versatile fruit. They can be eaten raw, poached, roasted, or blended to make smoothies. Enjoy your pears chopped up in salads, roasted with squash or root vegetables, or blend them up to drink or to make soup. Adding pears to your meal plan can help keep you full and reach your fiber goals. If you are looking to modify your carbohydrate intake, stick to small pears or eat half in one sitting. Pair your pear with a serving of protein, such as Greek yogurt, low-fat cheese, or a serving of nuts for a filling, protein, and fiber-rich snack. People with birch-pollen allergy can develop an allergy to pears due to a similarity in proteins. Symptoms of this birch-fruit syndrome are localized in the mouth and throat and generally appear within five to 15 minutes after consuming raw pear. Cooking the pears can make them safer to eat for people with this condition. Dirty Dozen: 2018 Shoppers' Guide to Pesticides With the Most Produce. Ewg.org. https://www.ewg.org/foodnews/dirty-dozen.php.